The battery compartment can overheat, posing fire and burn hazards. 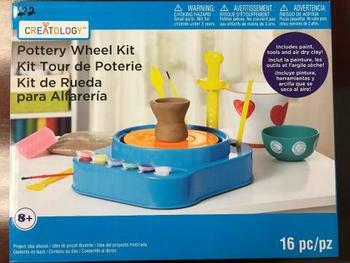 The Michaels Companies of Irving, Texas, is recalling about 263,000 Creatology pottery wheel kits. This recall involves pottery wheel kits sold under the Michaels private brand Creatology. The 16-piece kit includes a battery operated pottery wheel, 2 bags of clay, 4 molding tools, 6 paints, 2 paint brushes, and a sponge. The kits, manufactured in China, were sold exclusively at Michaels stores nationwide and online at www.michaels.com from August 2011, through February 2018, for about $25.